Chester Theatre Company’s production of Every Brilliant Thing deserves to be in a catalog of brilliant things itself… and at the top of the list. Beautifully crafted by director Daniel Elihu Kramer for performance in the round, the play lends itself to the setting of Chester’s intimate theatre. Each person in the audience can be touched by this engaging story of a young man’s journey to define and share exactly what makes life worth living. Joel Ripka is brilliant himself as the narrator of the tale. He gently pulls audience members into his world, having them play improvisational roles in the story of his life, and in the creation of his magnum opus: the list of every brilliant thing. 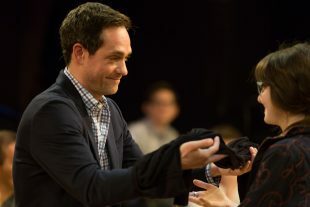 It is an unusual and delightful experience to attend this play, as so many of the audience members add their own gifts to the performance: simply reading a card with one of Ripka’s life-worthy items, offering a pen or book to help him enhance the story, or perhaps enacting the role of a teacher, girlfriend or even his dad. Each performance is unique, truly created in tandem with whoever happens to be at the theatre on any given night. That the interactions happen so comfortably and naturally are a testament to Ripka’s skill as an actor. This gentleman’s energy, subtlety and sincerity – also his joy in working with audience – make this unusual show happen. He beguiles theatregoers into participating in an effortless evening of improvisation with him, as though he had a magic wand. Beautiful music is woven into the story, kindness of Sound Designer Tom Shread. A variety of jazz pieces reflect special moments in the creation of the brilliant things list: one of the most amazing events in the play happens when Ripka plays and sings a Ray Charles number using a keyboard, with the assistance of two audience volunteers. Lighting Design by Lara Dubin is stellar as always, incorporating the entire hall in this in-the-round production. Since the leading man performs throughout the house, lighting is bright making it easy to see all that happens, but soft enough to create a sense of encompassing warmth. Chester Theatre has done it again…Every Brilliant Thing is a show everyone should experience to wake up to a new way of thinking about theatre, and to rise to life’s challenges through its uplifting and beautiful message.